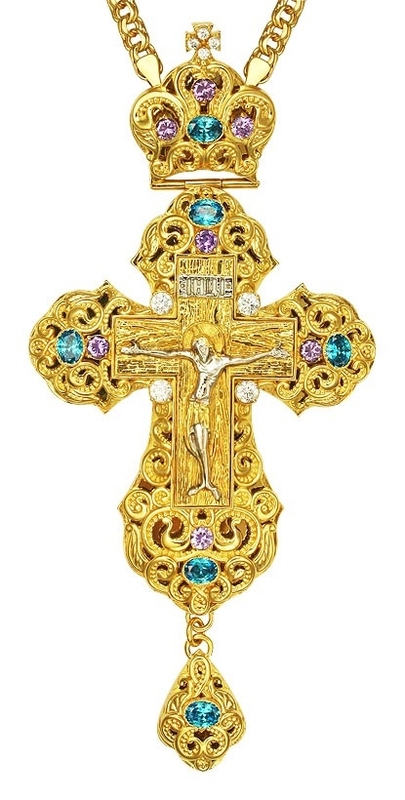 Pectoral cross - A164 (with chain) - Istok Church Supplies Corp.
Pectoral cross of the average size of the classical form is made of brass and covered with 24K gold-gilding, galvanized. The crucifixion is made in the technique of hand-painted enamel. The front side of the cross is decorated with inserts of phianite stones. The cross is sold in a presentable man-made leather packing with velvet lodgment.